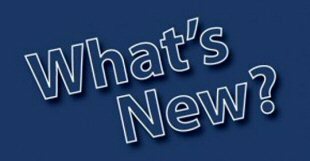 Our latest little jaunt took The Man Bird and I to the southern bit of the ‘shire, to Draycott in the Clay near Sudbury to be precise. You may recall a while ago that we reviewed Littleover Lodge; well this venue is owned by the same group, J C Hotels. From the roadside, The Boars Head Hotel is very nice to look at, and only having 23 rooms mean that it has a lovely quaint feel to it. There is ample parking around the back and clear directions to the reception. A very friendly lady greeted us in reception, and handed us over to the manager, Gabby. 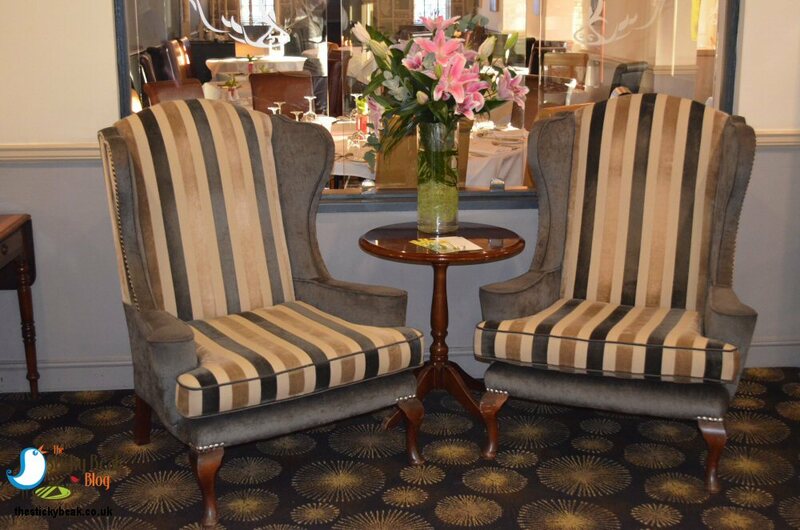 The reception area is nicely appointed with a couple of stylish high-backed chairs and an eye-catching floral arrangement. 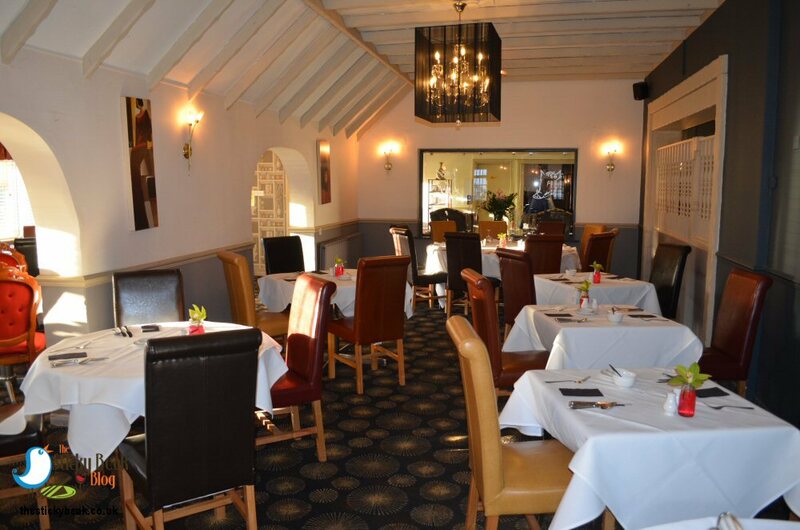 We went through to our table in the Royal Boar restaurant, which is one of several eating areas within the Boars Head Hotel. Our table was set with a dazzling white cloth, polished cutlery and a gorgeous fresh Orchid in a vase. 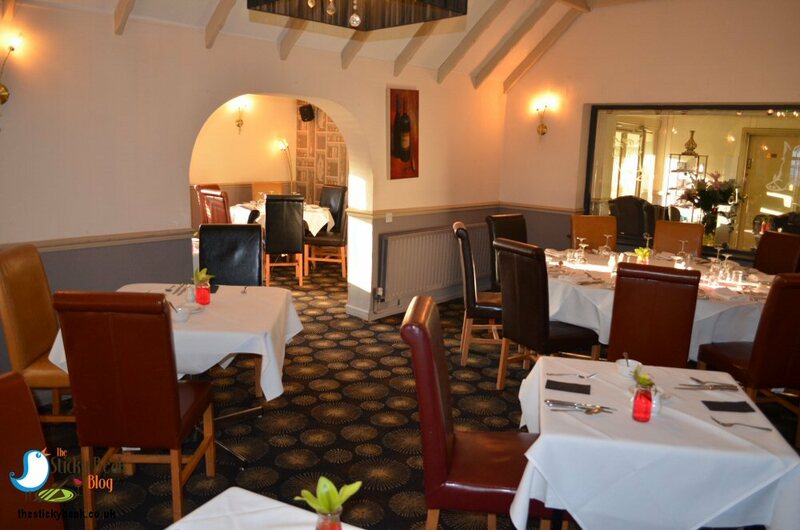 This area is for the a la carte menu, but there is a fantastic area further down that serves the Carvery and an extensive bar snack menu for those wanting something lighter than the traditional 3 course evening meal. 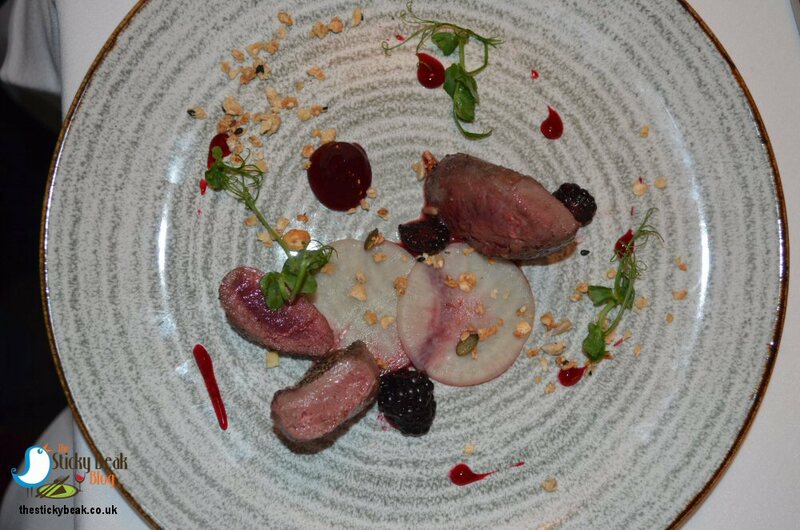 For starter I chose the Pigeon Breast with Beetroot, Blackberry, pickled Daikon, and Pumpkin seed granola; His Nibs went for the skewered Beef Fillet with mixed leaves, sweet Chilli, and crispy Vermicelli. Both dishes were carefully presented and looked beautiful on the plate as they were placed before us. My Pigeon breast had been sliced and arranged in between jewel coloured rounds of pureed Beetroot and whole Blackberries. Semi-circles of the pickled Daikon were the centre piece of the dish and the pale green Pumpkin seed granola had been scattered among the other elements. The meat was served pink and had a superb deep, rich flavour to it that lingered nicely on the tongue. A perfectly tart element was provided by both the pickled Daikon and the fresh Blackberry, and texture came from the crunchy Pumpkin seed pieces. 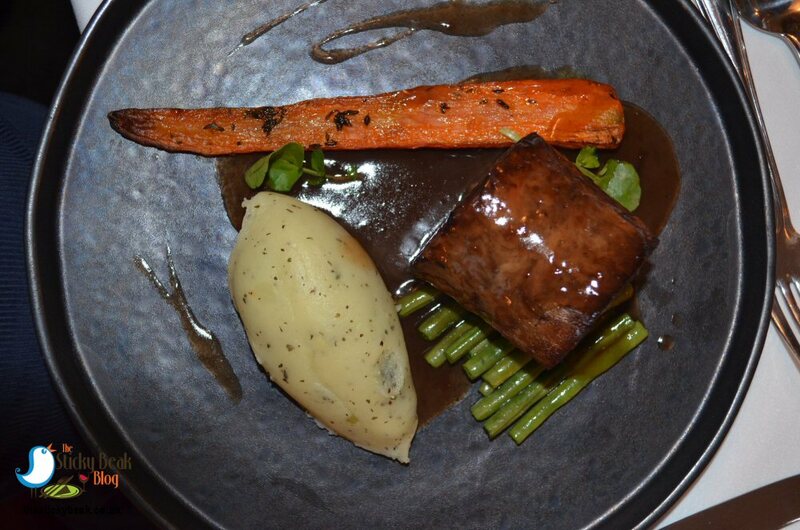 As a whole, the dish worked very nicely, providing a great mix of flavours and textures. Across the table, The Boy Wonder was tucking into wonderfully tender, melt-in-the-mouth cubes of beef fillet that had been interspersed with peppers on wooden skewers. A mixed leaf salad provided the base on which the skewers sat, and this had been dressed with a piquant sweet chilli sauce; there was enough of it to taste, but it didn’t drown the salad. As our plates were being cleared away the daylight was slowly fading, and at this point the Boars Heads etched onto the glass panels around the venue really came into their own. The Royal Boar restaurant has been very cleverly thought out – there are several partitions in the space that give cosiness to this area. It would’ve been so easy to just have an open plan restaurant, but by having a handful of tables in each section, it gives it a more intimate feel. 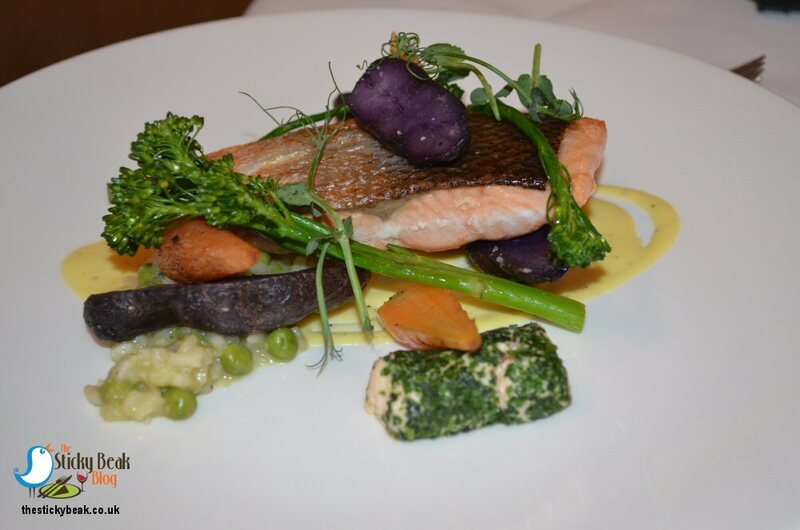 I had the skippers’ catch of the day for my main meal and on this occasion it was Salmon Fillet and mousse with Tender stem Broccoli, Purple Potatoes, and Pea Risotto. The Man Bird opted to have the Braised Lamb Ballantine with Thyme-roasted Carrot, minted mash Potatoes, and Port and Redcurrant jus. Now those of you who read the blog on a regular basis know all about my pet peeve of over-cooked fish, so I’m pleased to report that there’s nothing to bang on about here; other than how delicious it was! Honestly, the Salmon fillet was incredible; wonderfully moist and tasty, cooked to perfection with lightly crisped skin – utterly gorgeous. There was a lovely creamy Hollandaise sauce too, which was so silky in the mouth. I was very impressed with the mini mousse roulade too; it had a beautifully light texture and a nice herbed outer that was beautifully fresh on the palate. My pea risotto was very enjoyable, and there wasn’t too much of it – just a pleasing amount. His Nibs’ Lamb Ballantine was equally impressive. The Lamb was incredibly tender and bursting with taste, making it a real joy to eat. A large quenelle of gently minted, ultra-smooth mash made a superb partner to the meat. Alongside the Thyme-roasted Carrot were trimmed green beans, both of which had been cooked to perfection. As well as the vegetables on our plate, Gabby brought out another platter of veg for us to dig into and said that if we needed any more to just let her know. 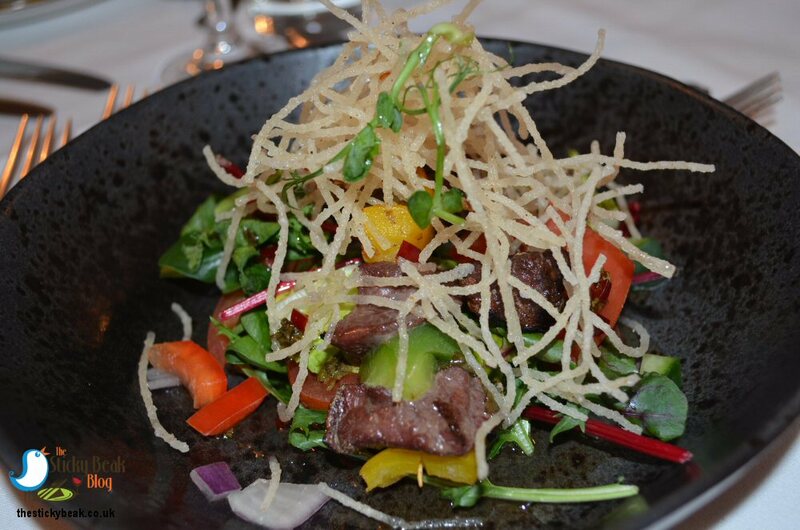 You’re never going to go hungry at The Boars Head Hotel that is for sure! 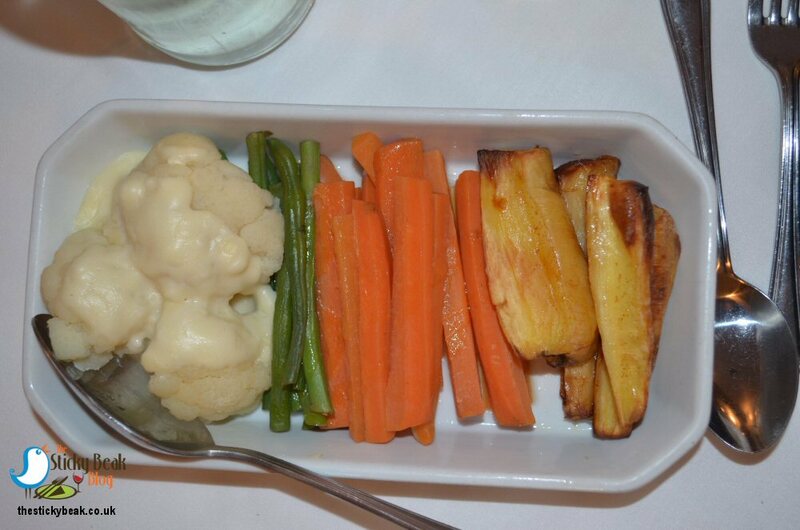 There was Cauliflower cheese, Carrot batons, more trimmed fine Green Beans, and roasted Parsnips in the rectangular platter, so we eagerly dug in. Pudding comprised of Salted Caramel Cheesecake with Toffee sauce and Caramel shards (mine), and Blackcurrant Pie with Italian Meringue and Chantilly Cream (The Man Bird). The portion size of dessert is no less generous than previous courses, so without any preamble we got straight to work! 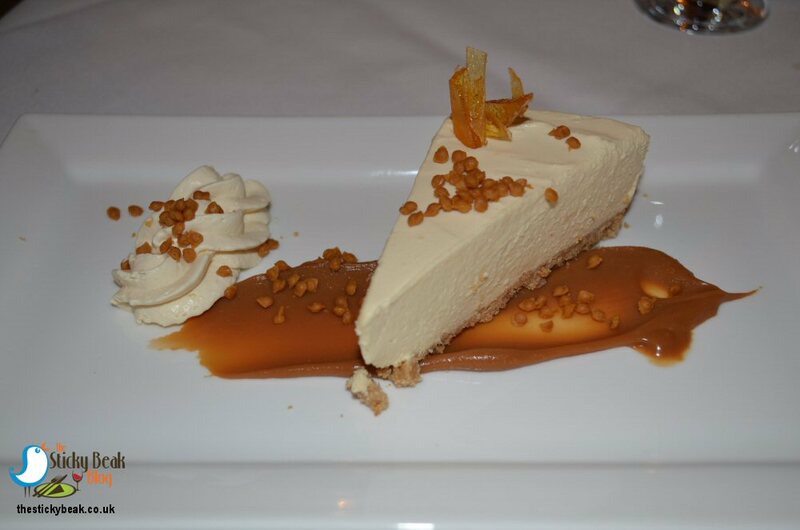 On top of a deliciously buttery biscuit base was a deep cheesecake that actually tasted of Caramel, lingering in the mouth like any decent version should. Dinky pieces of Toffee decorated the top and wide slashes of thick Toffee sauce adorned the plate, just begging to have the base swirled around in it. I popped the pieces of Caramel in to my mouth and crunched greedily away on them, letting them warm up and stick to my teeth. You can’t beat proper caramel and this was simply stunning. I have a love/hate relationship with Meringue (I love it, it hates me), so I always get my pleasure by proxy whenever His Nibs has it. On this occasion the contrast between the sweet indulgence of Meringue and the sharp fruit was absolutely superb; a finer end to the meal His Nibs could not have wished for. 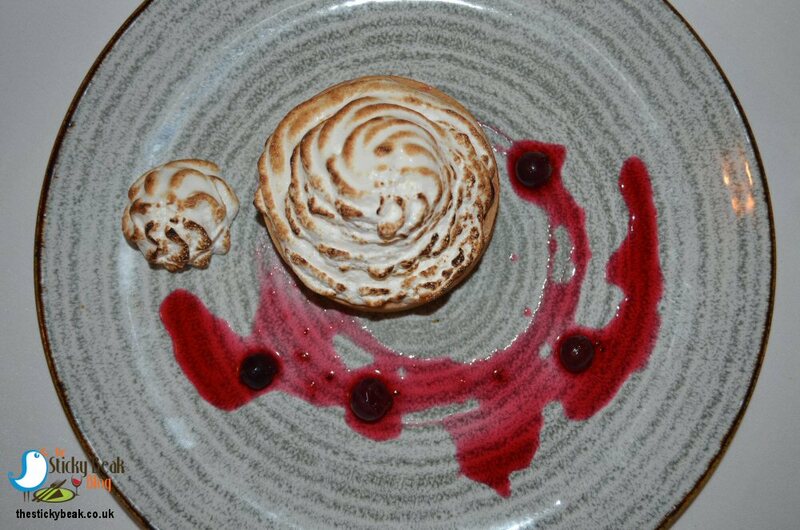 A firm, round pastry case held the tangy Blackcurrants and this had been artfully topped with piped spirals of Meringue, whose edges had been gently browned. Chantilly cream provided an indulgent silkiness to this glorious pud, which was declared to be the perfect finale of a wonderful meal. Thank you so much for your hospitality, and if you can’t find Chef Tom I’ve probably kidnapped him for personal use in my kitchen!